This is a story from the life of Alberto Giacometti. He was a Swiss painter and sculptor who achieved great success in his lifetime. The story follows James Lord, a young American from New York City, as he takes up the position of posing for Giacometti for the artist’s last portrait. James Lord is a character with much patience and sophistication. He always appears on screen in a fine and good-looking suit while he has a much extended stay in Paris. Giacometti turns something which should have taken a couple of hours to do into something that spans over a couple of weeks. Armie Hammer plays James Lord with an upper-class essence that fits his character perfectly. The character has much patience during the film. 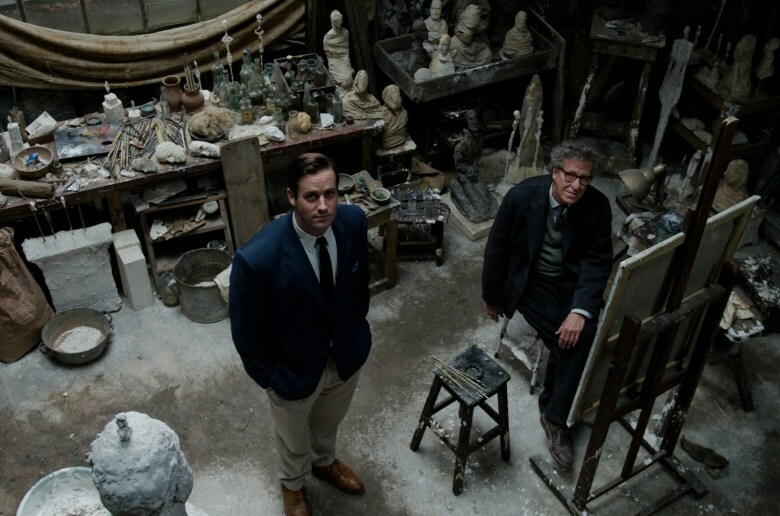 Geoffrey Rush plays Giacometti with the utmost eccentricity perfectly and basically without any flaws. Rush gives Giacometti that old look of someone who has been tired out by his own mind. He is such a good artist that his perfectionism gives Giacometti a disadvantage. Mr. Rush plays him with all of the character’s intricacies and is completely enveloped by his character. The house which was the main setting for the film was grey, white, and black. It resembled what I would think to be the quintessential artist’s home. The set was constructed brilliantly with several pieces of artwork and art tools all over the place. Diego Giacometti, who is played by Tony Shalhoub, is Alberto’s kind and mild-mannered brother who is a strong supporter of Alberto. He is basically the soundest and most rational human-being living in the Giacometti home. Tony Shalhoub plays Diego with a great subtlety and wiser soul which is portrayed beautifully in the film. This is a very nice little movie that fully illustrates the often times wild and eccentric life of great artists. The film communicates the idea that even with wonderful success, artists can still be unsatisfied with their proven efforts.